The African Community Center offers a bicycle class to refugees. That's one way it's finding new ways to use its resources as the number of refugees coming to the state dwindles. KUSA – Fear, uncertainty, excitement, cheering and screaming filled an otherwise nondescript parking lot in southeast Denver Friday. 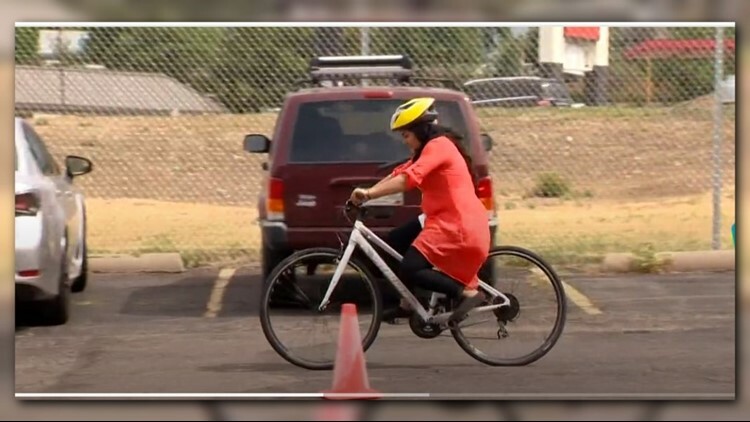 Women, grown women, were on their pedal-less bikes practicing “step-step-glide,” as Jamie Perkins from Bicycle Colorado instructed and cheered them on. The African Community Center offers a bicycle class to refugees. That&#39;s one way it&#39;s finding new ways to use its&nbsp;resources&nbsp;as the number of refugees coming to the state dwindles. “We have five women here representing three different countries, a couple from Afghanistan, two from the Congo one from the country of Eritrea,” said Kelli Woodard, community connections coordinator with the African Community Center of Denver. This is the second year The African Community Center, which helps refugees settle in the state, has offered the biking class. That’s because fewer new refugees are coming to Colorado. And fewer refugees means donations for new refugee families are sitting in storage, waiting to be used. Refugees are people seeking refuge from violence and persecution. Their legal status is granted by the U.S. government before they arrive on U.S. soil. Once in the U.S., they are legally here, able to live and work. Refugees are different form asylum seekers in that asylum seekers are asking to stay in the U.S. after having come here. “I think it's really sad to see this place as full it is [with donations] because we really have a desire to give things away and support our new arriving families,” Woodard said. Instead, the center is using its resources to find other ways to help by reconnecting with the community already here, and it still needs volunteers and donations. Nasreen Azizi, who participated in the bicycle program, moved here with her family from Afghanistan about a year and a half ago. She said she was able to move because her husband was a translator for the U.S. Army. Friday was Azizi’s first time on a bicycle; she’s 22. Ordinarily, Woodard would be focused on teaching new refugees integrating into American society: how to call 911, open a bank account, save and plan to buy a home. The Colorado Department of Human Services’ refugee program tracks how many refugees are being resettled in the state, how fast they can find work, how long they keep it and their economic impact. Statistics show the number of refugees who came to Colorado are dwindling: from 1,983 in 2016 to 1,512 in 2017 and down to about 500 so far in 2018. The African Community Center’s numbers are decreasing, too – from 581 in 2016 to just 129 so far in 2018. The refugee arrival numbers are tracked through September, so more refugees may come here before then. Melissa Theesen, African Community Center managing director, said executive orders from January 2017 decreased the number of refugees that could come in and placed stringent new vetting procedures. The U.S. will accept up to 45,000 refugees in fiscal year 2018, according to the U.S. Department of State. In October 2016, President Barack Obama set the refugee limit at 110,000 for fiscal year 2017. That number in March 2017 was lowered to 50,000. “Through the U.S. Refugee Admissions Program, the United States has offered new beginnings to more than 3.3 million refugees since 1975 – more than any other country in the world. The United States will continue to resettle the most vulnerable refugees while prioritizing the safety and security of the American people,” wrote a spokesperson for the department in an email to 9NEWS. The department cited the executive order signed by President Donald Trump in March 2017, Executive Order 13780, Protecting the Nation from Foreign Terrorist Entry Into the United States. The department said the order identified additional, more “thorough” screening and vetting procedures to identify threats to public and national security threats.